Using a not so spacious medium to promote a very spacious car. Mercedes wanted to promote their E-Class Estate via bannering. The E-Class Estate is the most spacious in its class. 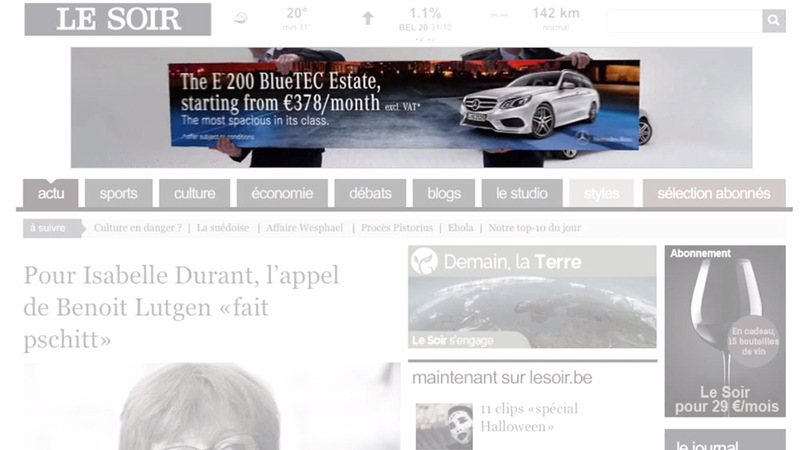 Bannering, however, doesn’t have much space to offer. So how use a not so spacious medium to promote a very spacious car? We created the Transportable Banner. A banner showing the E-Class Estate, which is suddenly being ripped out of its framework by two guys and transported to the E-Class Estate parked right behind it. Finally the two guys store it nicely in the trunk of the E-Class Estate. Our Transportable Banner came in four sizes (300 x 250, 728 x 90, 840 x 150, 995 x 123), appearing on websites which have a similar audience to that of Mercedes-Benz (De Standaard, De Morgen, HLN, Le Soir, Sporza, StuBru, Auto55, La DH…). Each size had a specific script because the transportable banner that goes in the car, has a shape and size according to the different banner sizes. So we had to come up with four different ways to fit it in the E-Class and make it appear as big as possible. 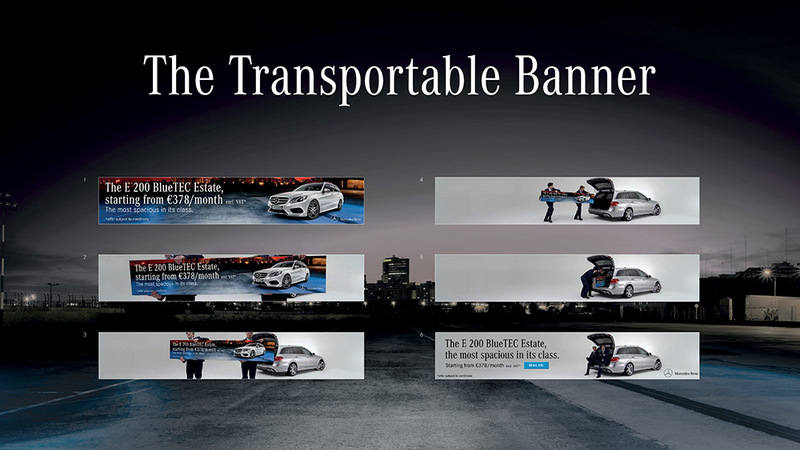 The Mercedes Transportable Banner clearly drew some attention: it got a staggering click-through rate of 7,8%.